You can find elderflower cordial online, or at stores specializing in British or European foods; Belvoir is a good brand. If you want some alcoholic zing to the syrup, feel free to substitute part of the cordial with St.-Germain liqueur. 1/2 cup elderflower cordial, or a bit more, depending on your sweetness preference. Whipped cream, sweetened with sugar, cordial, liqueur (e.g., St-Germain), or a mix thereof. Line the base of a 9-inch springform pan with parchment paper, then coat the pan’s base and sides with butter and sugar. Preheat oven to 350ºF degrees; I used the “convection bake” setting on mine. Using a whisk attachment, beat the eggs, sugar and salt until pale yellow, tripled in volume and very soft peaks form. Mix butter and lemon zest in a medium jug or bowl. Fold in the flour+baking powder. Scoop out a cup or so of the batter and plop into the butter mixture; whisk that until smooth. Fold the butter mixture into the main batter. Pour batter into pan. Bake for 25 to 35 to minutes. While the cake bakes, mix the elderflower cordial and lemon juice. After taking the cake out of the oven, poke holes throughout it with a thin skewer while it’s still warm in the pan. Evenly pour elderflower+lemon syrup over the cake. 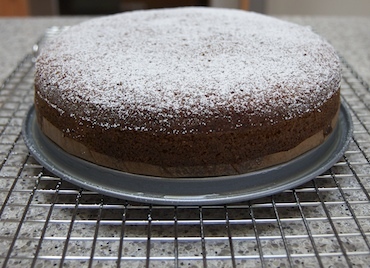 Allow the cake to cool and thoroughly absorb syrup before removing it from the pan. To serve, dust with a bit of powdered sugar, along with a dollop of flavored cream, if desired. This was written by sairuh. Posted on Friday, August 19, 2011, at 10:05 am. Filed under Food. Tagged British, cake, elderflower, lemons, recipe. Bookmark the permalink. Follow comments here with the RSS feed. Post a comment or leave a trackback.